This is a Final Four submission in our inaugural Stat Geek Idol contest. It was conceived of and written by Jeff Haley of hoop-math.com. For more from Jeff check out his posts from previous rounds. Sweet 16 entry: Can The Kentucky Wildcats Be Beaten By The Fast Break? There is such a wide diversity of playing styles in college basketball. The pace at which different teams play is one of the major ways in which playing styles differ. Teams like North Carolina work to push the tempo, and shoot early in possessions. Other teams, like Wisconsin, play at a snail’s pace, milking the shot clock. Quick shots and shots taken later in a possession are often very different. Analyzing play-by-play data is a powerful way to understand how offensive pace affects both the types of shots that a team takes, and the outcome of these shots. Using a play-by-play database that contains each play in over 4400 games from the 2011-2012 NCAA basketball season, I set out to try to understand the effect of pace on offense. I generally like to break shot types down into several categories. In the first grouping, we have shots attempted at the rim, which includes dunks, layups, and tip shots. The second category is two point jump shots. The third category is three point jump shots. In this study, I have focused on the first shot of each possession. None of the shots considered are the results of offensive rebounds. For the purposes of understanding transition play, possessions that start off of dead ball turnovers aren’t particularly interesting, as they don’t provide an opportunity to push the tempo. This article focuses on possessions that start with a steal, a missed shot by the opponent, and a made shot by the opponent. The figure below shows how the type of initial shots that teams take change as the time after taking possession of the basketball changes. The data in the figure are color coded based on how the possession started. Possessions that start with a steal are red, possessions that start with a missed shot by the opponent are blue, and possessions that start with a made shot by the opponent are green. Each panel of the figure plots the percentage of total field goal attempts for a particular shot type as a function of the time after taking possession. Using the figure above, it becomes clear that the way in which a team takes possession of the ball has a big effect on the type of shot taken if it is taken in approximately the first 10 seconds of a possession. After the first 10 seconds of a possession, the way in which a team takes possession of the basketball doesn’t seem to matter very much. This result is pretty sensible. 15 to 20 seconds after the start of a possession, any fast break opportunity should be over, and both the offense and defense will have settled into their half court routines. Transition play in the first 10 seconds of a possession is strongly influenced by how a team takes the ball. After stealing a ball, teams generally go to the rim. 70% of all attempted shots in the first 5 seconds after a steal occur at the rim. 40% of all shots that occur in the first 5 seconds after an opponent miss are attempted at the rim, while roughly 30% of shots attempted in the first 5 seconds after a made basket by an opponent are at the rim. Qualitatively, these results aren’t surprising. Steals often lead to quick layups, while fast breaking off of a rebound generally gives you a better opportunity to get to the bucket than does fast breaking off of a made basket by the opponent. After a made basket by the opponent, shots taken in the first 10 seconds of a possession are more likely to be three point shots than any other shot type. After a missed basket by the opponent, attempts at the rim the most likely shot type to occur in the first 10 seconds of a possession. Teams shoot fewer early two point jump shots than any other type of shot. While teams are more likely to take three point shots in the first 10 seconds of possessions after a made basket by the opponent, the field goal percentage on these shots is not as high as it is for three point shots that occur later in the possession. We can see this in the figure below. 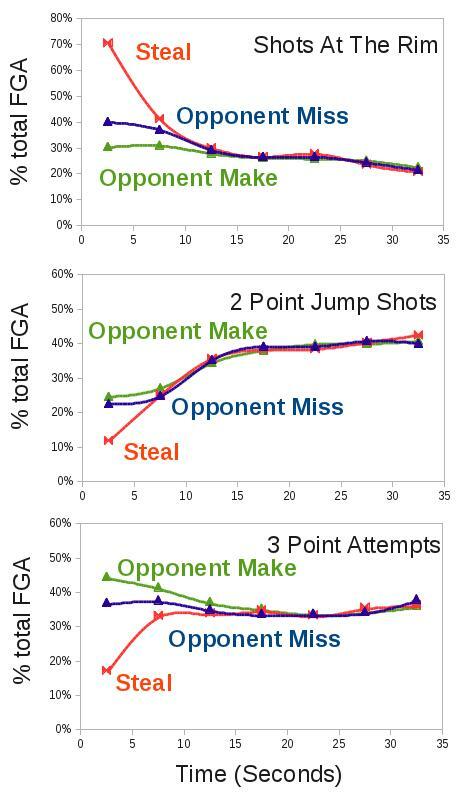 The top panel in the figure below shows the effective field goal percentage (eFG%) for each type of shot as a function of time after taking possession of the ball. Again, these data are only for the initial shot of a possession. The data are color coded based on what type of shot was taken, and on the way that the possession started. Shots taken at the rim are indicated with the color blue, 3 point jump shots by the color red, and 2 point jump shots by the color green. Somewhat different shades of each indicate the origin of the possession. I have indicated with arrows in the figure a few cases where the origin of the possession appears to be meaningful. 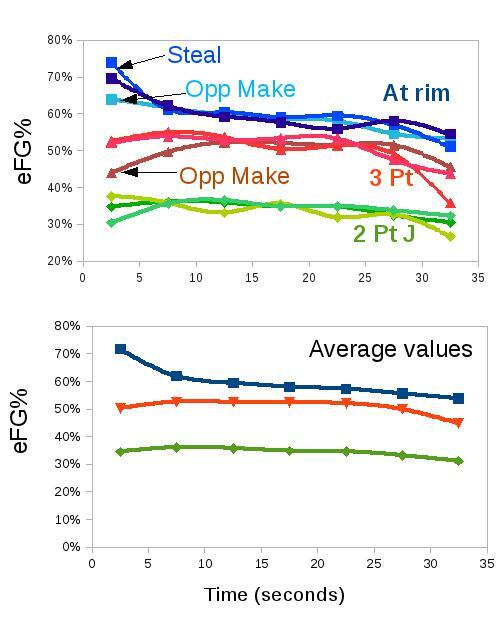 The bottom panel of the figure shows the average eFG% for each of the three shot types, where the average is taken over all of the different types of possessions. Quick three point shots that are taken after a made basket by an opponent are less likely to go in than almost any other type of three point shot. The effective field goal percentage on three point shots taken within the first 5 seconds of a possession is 45%, which isn’t particularly good. This is about the same as three point shots that are taken more than 30 seconds after taking possession, which are often low quality shots intended to beat the shot clock. After the initial 10 second transition period, shot distributions and shooting percentages don’t depend on how the possession started. As the time to the first shot of a possession increases, the percentage of initial shots attempted at the rim decreases. 29% of initial shots taken between 10 and 15 seconds after the start of a possession are attempted at the rim, whereas 22% of initial shots taken more than 30 seconds after the start of a possession are at the rim. 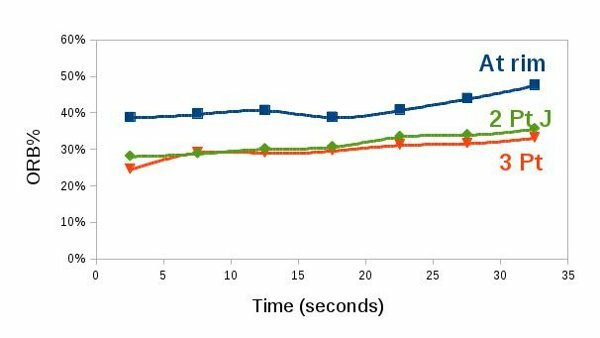 Over this same time range, the percentage of two point jump shots gradually increases, from 35% of all shots taken between 10 and 15 seconds, to 41% of all shots taken after 30 seconds. For whatever reason, the percentage of initial shot attempts taken from three point range reaches a minimum value of 35% between 20 and 25 seconds, but then increases as the time to the initial shot increases. Effective field goal percentage generally decreases for two point shot attempts as the time to the first shot increases. This can be best seen in the second panel of the figure above. As a possession becomes longer, teams generally have a harder time making shot attempts at the rim and two point jump shots, although at least for two point jump shots this decrease is fairly gradual. Effective field goal percentage from three point range appears to reach a plateau value of around 52%, before dropping off significantly as the shot clock winds down. The combined effects of changing field goal percentages and changing shot distribution result in a decrease in effective field goal percentage as the time to the first shot increases. As a possession wears on, teams are more likely to settle for two point jump shots, less likely to get to the rim, and more likely to miss their two point jump shots and attempts at the rim. The average effective field goal percentage on initial shots between 10 and 15 seconds is 49%, between 25 and 30 seconds is 45%, and after 30 seconds is 41%. What Happens With Offensive Rebounds? Offensive rebounding percentage (ORB%) measures the percentage of missed shots that are rebounded by the offense. The figure below shows the offensive rebounding percentage on missed initial shots for each of the three shot types, as a function of time after taking possession. On average, the offensive rebounding percentage on shots at the rim is about 10 percentage points higher than the offensive rebounding percentage on jump shots. A likely explanation of this is that shots at the rim are often contested by helping defenders, and the helping defender may not be in good position to box out and rebound. On jump shots, the defense is more likely to be in good position to get a rebound. Aside from the greater effective field goal percentage of shots at the rim, shots at the rim are also good for the offense because they are more likely to lead to second shots when they are missed. What is surprising about the data in the figure is that offensive rebounding percentage tends to gradually increase as the time to the first shot of the possession increases. Initial misses at the rim taken between 10 and 15 seconds into the possession are rebounded 40% of the time by the offense, whereas initial misses at the rim taken after 30 seconds of a possession result in offensive rebounds 48% of the time. Similar increases in offensive rebounding percentages occur on missed jump shots. I have no idea why this might be the case. I think there are a few practical things that we can learn from these data about how offense works in college basketball. 1. Shot distribution is dynamic. The types of shot opportunities that present themselves change significantly throughout a possession, and at least early in the possession are greatly influenced by how the possession started. While this is no surprise, these data quantify the effect. 2. Transition offense can be very efficient. Shots taken in the early parts of a possession are generally the best shots that teams can get. Once the transition period of a possession is over, it becomes more difficult to get shots at the rim. 3. Shooting efficiencies are lowest in the last five seconds before the shot clock expires. Additionally, there is a gradual decrease in shooting efficiency as the time to take the first shot of a possession increases. This gradual decrease in efficiency is partly offset by an increase in offensive rebounding rates as the possessions become longer. 4. Getting to the rim is not only the most efficient way to score from the field, but missed shots at the rim are far more likely to be rebounded by the offense. 5. College basketball teams probably take too many quick three point shots after their opponent scores. 45% of the shots taken in the first 5 seconds after a made basket by an opponent are three point shots. The effective field goal percentage of these quick threes is lower than it is at any other point in a possession. The effective field goal percentage of three point shots is at its highest between 10 and 25 seconds after the start of the possession. Remember, for more from Jeff check out his posts from previous rounds.